My step-mom just sent me a few books that I will be adding to the PT Mollie library. One of them is called Thrive Foods by Brendan Brazier. It offers 200 plant-based recipes for peak health. After thumbing through, I found a recipe for breakfast cereal. It sounds so good I might have it as an after work snack too. It makes 4 cups (~5 servings). 2. 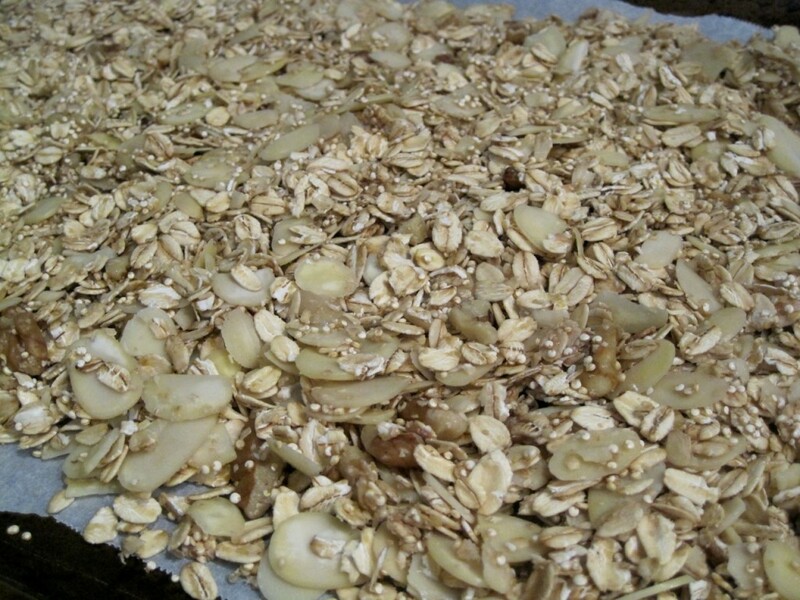 In a large bowl, combine pear, oats, almonds, chia seeds, hemp protein, sesame seeds, sunflower seeds, stevia, and sea salt. 3. In a small bowl, blend together hemp oil, molasses, apple juice, and ginger root. 4. Add wet ingredients to dry ingredients and mix well. 5. Lightly oil a baking tray. Spread mix onto tray. 6. Bake for one hour. Let cool and break into pieces. 7. Keep refrigerated for up to 2 weeks. Let me know if you make any variations to the recipe. Yum!